Judges' education or illustrated standard committees and the artist work as a team toward successful completion. Mentors provide insight into the breed standard and the artist interprets at the committee's direction. Work on an Illustrated STandard Project is a PUzzle Waiting to Be Completed. 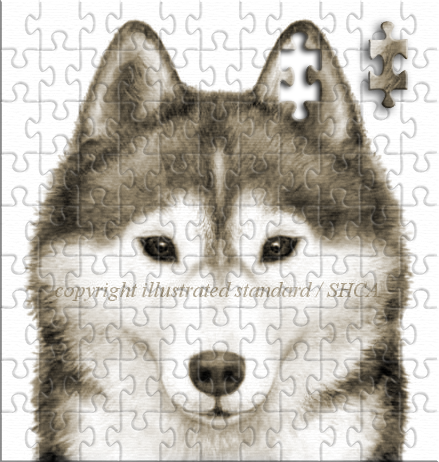 Think of the illustrated standard project as a puzzle. The success and time of completion in any illustrated standard project is, in large part, dependent upon a strong committee. It is not the number of members on the committee that is important. In fact, this is a case where less is more. It is the unity among those members regarding what constitutes a correct specimen of the breed as described by the standard for the breed and guided by the basic principles of anatomy. It is the dedication of the illustrated breed standard committee which guides the project. A good working relationship exists when illustrated standard or judges' education committee members and artist are committed to achieving the best representative examples for the particular dog breed standard as specified by the parent club. Although individuals may have varying preferences and priorities, the effective illustrated standard committee recognizes this and moves forward with the standard of the breed as their guide. What is correct and acceptable for the breed? If the committee works in harmony and guides the artist toward the goal, the illustrated standard project will conclude in a timely and successful manner. Provide relevant photos to your artist of specific points. The viewing angle effects the shape of the object. Photos depicting the same angle to be illustrated are the most helpful. High resolution photos are always better than low resolution web versions. Details must be seen to be captured. "Is this correct?" is the single most important question for the illustrated breed standard committee to keep in mind when reviewing drawings. Each individual may have differing interpretations of an ideal specimen, but we must ask ourselves if it falls within an acceptable range of correct according to the breed standard. Set a specific time limit for committee review of each drawing to keep the project moving forward so that it is fresh in everyone's mind. Have members forward comments to the illustrated standard committee chairperson, who will then determine and compile a single list of changes for the artist. If there are differences of opinion on changes among members, it may be necessary to confer with the committee again before agreeing on a consensus and sending the list of changes to the artist. Most clubs do this by email communication. Communicate more effectively by providing specific instructions for changes. Rather than saying that something "doesn't look quite right," or that something needs to be shorter or longer, tell your artist to change a, b, or c by the specific angle or measurement, or provide a photo which demonstrates the desired point. Don't second guess yourselves. If you look at a drawing a thousand times, you will see a thousand different things. Know your goal, point toward it, complete it, and move to the next goal. It is important to begin with the foundation drawings and build on those. Remember, above all else, that you are working together. If your illustrated standard committee has a strong group of individuals and can work as a harmonious unit, aiding the artist in achieving your goals by providing constructive direction, you will be successful. I'll be honest. This isn't the job for everyone. You have to have pretty thick skin to endure the criticism, changes, and differing opinions which are necessary to achieve successful completion. I have picked up the pieces, more than once, for clubs that began with another illustrated breed standard artist who was honestly not familiar with what it takes to complete this type of project. The pay per hour is often less than minimum wage. Committee members work with no compensation so must be truly dedicated to furthering knowledge of their breed standard to persist in the project. Still... you have to put this in perspective and ask why anyone would want to do this, committee or artist? The answer is simple. We work together because it is important. It is important to the breed and to those who seek to know it as unique from all other breeds. For that reason, we work together to get it right and hope that it will make a lasting contribution. 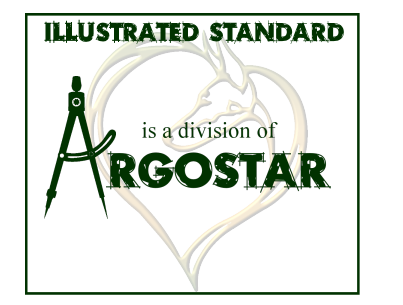 See more of my work at Argostar.com or contact me at any time with questions.